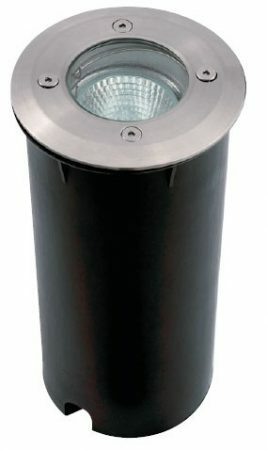 A compact in ground marine grade stainless steel drive-over light, supplied with both low voltage MR11 and mains voltage GU10 lamp holders. Die cast aluminium housing, with protective thermoplastic outer sleeve and clear 10mm thick toughened glass lens rated at 2000Kg static load. Please Note: If a halogen lamp is used, the glass surface will get very hot. It is highly recommended that a GU10CFL or LED lamps are used in this application for cooler safer operation.